Which Type of Resume Should You Use? Writing a resume may feel like a daunting task, but it serves as an essential component to most job application processes. However intricate writing a resume may feel, most recruiters spend only around six seconds reviewing a resume. Keeping this in mind can help you create a resume that conveys the most essential information in a clear, concise, and attractive manner. This guide explores the ins and outs of creating successful application materials for your field of employment, delving into how to format, sequence, organize, review, and submit resumes and cover letters that won't end up on the bottom of a recruiter's pile. Different jobs call for different kinds of resumes. A variety of factors, such as your desired field of employment; your professional or academic history; your individual career path; and your extracurricular, volunteer, or creative experiences, can affect the type of resume you should submit. This section outlines the three main types of resumes, exploring when to use them and where you can find relevant templates and samples. A chronological resume lists academic and professional experiences in order of when they occured. In other words, chronological resumes begin with a job seeker's current or most recent job and go backwards in time. Chronological resumes may also include a career summary statement and catalog relevant achievements, honors, awards, and extracurricular activities. When Should You Use a Chronological Resume? Chronological resumes illustrate the linear timeline of a candidate's history, sharing their professional progress within a given field. Therefore, this resume type represents a good option for people applying to a similar or more advanced position within their current field. Applicants applying to a job in a new field or those who lack significant relevant professional experience may prefer a resume without chronological constraints. ResumeGenius: This website provides several sample resumes for individuals applying to jobs in diverse areas, including customer service, food service, healthcare, and office administration. American University: American University's online career center offers helpful descriptions, templates, and examples of various resume types, including several examples of chronological resumes. Hloom: In addition to more than three dozen chronological resume templates, Hloom offers a selection of sample chronological resumes for electricians, architects, teachers, nurses, compliance officers, and graphic designers. Unlike chronological resumes, functional resumes list an applicant's relevant experiences and skills at the top of the document, regardless of chronology. This allows applicants to highlight the experiences and qualities they deem most relevant to the job. Beneath the ability section, applicants can provide a chronological history of their employment. Functional resumes best serve applicants who frequently change jobs, have gaps in their professional history, want to reenter the workplace, or wish to transition into a new field. Rather than drawing attention to a candidate's inconsistent or irrelevant professional timeline, functional resumes instead highlight a candidate's combined skills, experiences, and assets, creating a cohesive picture of an applicant's professional value. Hloom: Hloom boasts sample functional resumes for people in sales, graphic design, retail, and education, as well as for professionals transitioning careers. It also offers a variety of resume templates, from simple designs to heavily graphic-based documents. Resume Genius: Here, applicants can find a selection of functional resume templates, including those geared toward waiters, teachers, office workers, customer service representatives, and construction workers. Template.net: This website offers several examples of functional resumes. Job seekers can view templates and sample resumes for accounting, business management, and editing jobs. A CV -- short for curriculum vitae -- differs from a resume in that it highlights academic achievements and experiences, rather than professional ones, thereby conveying an image of the applicant as a scholar. Whereas resumes typically do not exceed one page in length, CVs can run up to three pages or longer, providing a detailed picture of an applicant's teaching, research, and publishing history. Candidates applying for jobs that require a demonstrated history of creative work, research, or publications should submit a CV rather than a resume. This holds true for academic, teaching, research, and creative positions, but may also include applications for creative residencies, conferences, scholarships, and fellowship opportunities. Overleaf: Here, applicants can find an extensive gallery of CV examples and templates, including generic examples and those provided by actual professors and graduate students. The University of California, San Francisco: UCSF offers a selection of academic CV samples online. Applicants can also view samples of entire application packets, including a cover letter, CV, and teaching philosophy. Hloom: Hloom offers CV examples for different areas of academia, such as physics, music, literature, environmental sciences, and chemical engineering. Applicants can also find example CVs for professorships, postdoctoral positions, and Ph.D. programs. Scannable resumes allow computers to review the content of the document, helping employers narrow down and search through a large quantity of resumes electronically. Scannable resumes rely heavily on keywords and formatting. You can easily modify a traditional resume into a scannable version. The first step involves adding a list of keywords below your name. This list of keywords should include the words and phrases that most concisely describe your relevant skills and experience. Applying simple and uniform formatting (e.g., using a consistent font throughout) allows a computer to more accurately scan your resume. When Should You Use a Scannable Resume? 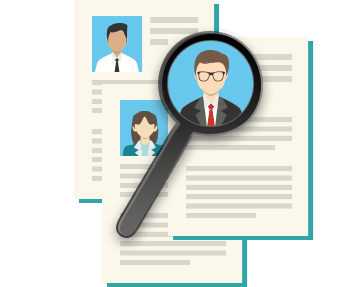 You should use a scannable resume only if you know that the employer in question uses some kind of digital scanning technology to review applicants' resumes or if the application specifically requests one -- if you feel uncertain, you can always ask. Since the early 2000s, fewer employers rely on scanning technology, instead using online application and database systems. Purdue University Online Writing Lab: Purdue's online writing lab offers a host of valuable materials, including an example of a traditional resume converted into a scannable resume. Penn State e-Education Institute: As part of an online style manual called "Effective Technical Writing in the Information Age," Penn State offers a sample computer scannable resume. CareerChoiceGuide.com: This website offers an example of a computer scannable resume along with the corresponding, traditionally formatted resume that was modified. Regardless of the applicant, field, or job in question, all resumes require a few basic elements. The following section goes into greater detail about what categories of information appear universally on resumes and CVs. Although formatting and details vary depending on the circumstance, applicants can expect to include some version of the information listed below. Applicants should always put their contact information at the top of their resume or CV. This information should include the applicant's full name, location (city and state or full address, if desired), phone number, email address, and a link to their professional website (if applicable). Applicants can also link to an online portfolio of their work or their LinkedIn page. In this section, applicants should describe their highest levels of education or training, listing all postsecondary programs they completed or attended. Applicants should list the name and location of each school, the type of degree or certification earned, and their dates of attendance and/or graduation. This section typically uses columns or bullet points of information rather than full sentences. This section should provide a detailed overview of an applicant's professional history. For each job, applicants should include the name of the organization or company, the title of the position they held, the city and state, their dates of employment, the duties they performed, and any notable achievements. Many people choose to list their duties and achievements by writing concise descriptions for each bullet point. Depending on the field, some resumes should include a list of relevant skills. For instance, individuals applying for tech jobs might list the computer programs and coding languages they know how to use. Other applicants might want to list the languages they speak, the tools or machinery they know how to operate, or the technologies they feel comfortable navigating. Introductions, also known as objective statements, serve as a quick, precise way for applicants to communicate how their personal experiences and objectives align with their prospective employers' hiring goals. These sections typically appear at the top of a resume (below the applicant's contact information), run between a sentence and a short paragraph in length, and refer explicitly to the name of the hiring organization and the desired position. Similar to an introduction, summaries (sometimes referred to as qualification summaries) communicate a candidate's overall abilities and skills in a short list at the top of the resume. A summary typically consists of several bullet points, illustrating the applicant's most relevant qualifications. Qualification summaries remain uncommon in resumes and may stand out to potential employers. Photos: Resumes serve as an opportunity for employers to pay attention to your skills, experience, and achievements -- not your appearance. Despite living in a graphically centered culture, adding photos or videos to your resume may end up distracting from the content. Personal Achievements: Resumes should highlight your professional or academic achievements, but they should not list irrelevant accomplishments in your personal life. While it should interest a potential employer that you were recognized as employee of the year at your last job, they may not care that you took first place in a marathon or karate competition. Irrelevant Information: Employers do not need to read about every detail of your professional or academic history -- only include details relevant to the job in question. For instance, someone applying for a position as a chemical engineer need not mention the summer they spent working at an ice cream shop in high school or the weekends they currently spend volunteering for an animal shelter. Outdated Accomplishments: Most recruiters want to see the past 10-15 years of an applicant's professional history. Even if a job, volunteer, academic, or extracurricular experience feels relevant to the position, if it happened in 1985, you might want to leave it off your resume. However, major accomplishments or experiences, such as winning a significant award, holding an esteemed position, or earning an academic degree, should be included regardless of when they occurred. Partisan or Religious Information: You might want to remove or alter any information in your resume that could induce bias in a recruiter. For instance, if you volunteered for a particular political party or worked with a particular religious organization, you may want to neutralize the wording to prevent the recruiter from experiencing a biased reaction to your application. After determining what to include on your resume, the next step revolves around figuring out how to write about it. Applicants should pay careful attention to the content, organization, and consistency of their information, as well as how their resume appears on the page. Applicants should also tailor their resume to each individual job application, drawing attention to whatever skills and experiences most accurately relate to the job's required or preferred qualifications. Recruiters want resumes that communicate information clearly and concisely. Action verbs help applicants economize their language while incorporating words that pop; they can also create a stronger visual impact of skills or achievements. For example, "I helped with a training event" can become "I orchestrated a training event," and "I worked to start a new program" becomes "I piloted a program." Accomplishment statements help applicants concisely illustrate their achievements and the qualitative or quantitative value these achievements brought to their current or former employer. The general formula for creating a high-impact accomplishment statement involves identifying a problem, explaining how you took action to solve it, and illustrating the positive results. Because these pack a big punch in a short amount of space -- creating an entire narrative arc in only a sentence or two -- applicants should try to incorporate these statements whenever possible throughout their resume. Adding keywords to your resume may help it advance past the first stage of review. When submitting a scannable resume to a large company, it may prove especially important to use keywords. Because applicant tracking systems digitally scan resumes, they may weed out resumes that lack certain relevant keywords. When deciding what keywords to add, refer to the job description -- employers typically pull keywords from their own language. Keywords may also include concrete skills or experiences, such as types of computer software, language skills, or leadership experience. Whenever possible, use specific numbers or data to quantify your professional achievements. Rather than writing that you greatly increased workplace productivity, write that you increased workplace productivity by 15%. The same goes for quantifying money and people, e.g., you received $50,000 in grant money or recruited 10 employees. Make sure to provide a timeframe for numbers. Rather than mentioning that you authored 2-3 blog posts, write that you published 2-3 blog posts per week. To accommodate varying application guidelines, make sure to prepare multiple formats of your resume. For instance, some employers might prefer a PDF, while others may require a .doc or .docx file. You may also find it helpful to print off a version of each document beforehand, so that you can gain an idea of what a hard copy will look like to an employer. This can also help you catch potential formatting errors that may occur when saving your resume to a different file type. The layout, organization, and resulting appearance of a resume can carry just as much import as the content. A sloppy, unorganized resume may signal to an employer that you lack attention to detail, patience, or organizational skills. To avoid looking careless, make sure to create a clean, error-free resume that adheres to a unified format. Whether you decide to create a chronological or functional resume, make sure to stick with one format throughout your resume. Create distinct sections (e.g., professional history, education, skills, etc.) and limit these sections to the appropriate and relevant information. The headers of each section should match, as should the style and format within each subsection. While it may seem like a fun way to stand out, a highly stylized or playful font may look unprofessional or make your resume difficult to read. Choose a simple, easy-to-read font -- no smaller than size 9 -- and use it consistently throughout your resume. Aside from the text you want to stand out, such as section headers, titles, or your name, the font size for bullet points and supplemental information should remain consistent. Avoid excessive underlining, bolding, or italicizing, and never combine two at once (e.g., do not underline and italicize a header). Adding lines can help visually organize different sections within your resume. You can add a horizontal line under each subject header (e.g., work history, education, etc.) or add a vertical line to separate marginal information from the main body of the resume. Instead of lines, you can also create boxes around headers. Although adding too much color can become a distraction or make your resume seem busy, adding a touch of color when appropriate may help your resume stand out. Color can also communicate certain character attributes. For professionals trying to sell a personalized image or brand, color may also help radiate a particular value, e.g., applicants in an environmental field may want to incorporate green text or formatting. Rather than communicating complicated numerical information through words, you can create a simple pie chart or graph. Graphs can help recruiters quickly assess information such as sales data, allowing them to engage with your resume in a deeper way. You can also create charts to show the breakdown of your skill sets or professional experience. A cover letter introduces you as an applicant and provides greater context for your other application materials. It allows you to explicitly state how you qualify for a position and what you would bring to the table if hired. It also gives you the chance to list any personal connections to the company, e.g., people you know who work there. Beyond this, it allows recruiters to gain a more nuanced sense of who you are as a person, as conveyed through your writing style and the background information you choose to provide. Do: Mention anyone who referred you to the job listing or currently works at the company or organization. You can also explain how the company's product, location, or culture personally appeals to you. Do not fabricate personal ties, but if they exist don't hesitate to highlight them. Do: Use the active voice and action verbs (discussed earlier) to illustrate how your qualifications and experiences suit the employer's needs. Do: Keep your letter under a page. Most cover letters include 3-4 paragraphs of information. If applying by email, the cover letter should consist of around two paragraphs. Do: Address your letter to a specific person at their professional business address. Ideally, you can find this contact person and their information through the job listing. If you do not know how to address your letter, address it to the hiring committee. Do: Ask someone you know to proofread your letter before you submit it. Even if you look over your letter a dozen times, you might miss an error, typo, or something that sounds unclear. Don’t: Say anything negative about your current or former employers. In addition to sounding unprofessional, this may sour the letter's mood. The cover letter should feel positive and enthusiastic. Don’t: Use the word "I" too often. Rather than talk about yourself and your history, the cover letter should primarily focus on the employer, the job, and how you can help an employer reach their goals. Don’t: Mention pay. The cover letter does not serve as a place to discuss previous or current salaries. Refrain from including your desired or expected salary. Don’t: Suggest that you could fill any number of roles within the company. The cover letter should specify which job you want to apply for, illustrating the experiences and skills that qualify you for this particular position. Don’t: Repeat the information in your resume. Rather than mirroring your resume, the cover letter should supplement, enhance, and provide context for your resume. It should also reflect your personality. Discuss information not found on the resume, such as why the job excites you. Nothing stings quite like finding an error on your resume after you send it to an employer. To give yourself the greatest chance of earning an interview, always review and proofread your resume before sending it out. In addition to checking for errors in grammar and spelling, look for redundancies, awkward phrasing, formatting issues, and style inconsistencies. 20 Second Test: Give your resume to a friend and allow them 20 seconds to look it over. If they can accurately glean the points you most want to convey to a recruiter you can consider your resume successful. If they can't, try revising or reordering your resume to increase clarity and precision. Spelling, Syntax, and Grammar: However basic they may seem, spelling, syntax, and grammar mistakes can make you appear unprofessional, careless, or sloppy. Make sure your resume remains free of errors and typos. In addition to reviewing your resume on a computer, print it off and closely review a hard copy. You can also ask a friend to lend a second pair of eyes or try reading it out loud. Uniform Formatting: Check your resume for consistent formatting and style. Make sure the font type, size, and color remain consistent where you want them to remain consistent. Also double check spacings, page breaks, and graphics. Does the Content Relate to the Job? : Before sending in a resume, read through and make sure the version you plan to send feels relevant to the job in question. Remove any irrelevant or unnecessary information and add information that speaks directly to the position. Uniform Language: Make sure the language you use throughout your resume remains consistent. When talking about current jobs, use the present tense; when discussing previous jobs, use the past tense. If using bullet points, decide whether to write in complete sentences or fragments, and make sure you remain consistent throughout. If using an oxford comma, use it consistently. Even after determining the right type of resume to write and getting familiar with quality resume content, there can still be some uncertainty about just how job seekers should sell themselves to prospective employers. After all, resume-writing can be a particularly intimidating part of getting a job. Resume and job search expert, Krista Morris, provides answers to some of the most frequently asked questions to help job seekers present their best selves to employers. Do I need to make a stand-alone resume? Or can I just use my LinkedIn profile? You absolutely, positively need a stand-alone resume. LinkedIn alone will not get the job done. Here's the thing: I'm Gen X, and there are still a good number of Boomers out there with the power to hire you (or not), and I LOVE the look and feel of paper. There is nothing quite like it. And as a recruiter, when I'm sifting through the top 10 candidates to decide which five I want to bring in, I print every single resume. Each one. I examine them all side by side, and so, while LinkedIn is a great tool for headhunters and recruiters to find you, you still need a formal resume to submit. Can a resume be longer than one page? Resumes can definitely be more than one page. I realize that conventional wisdom says we should all be cookie cutter automatons, but honestly, we are all different. And since each of us has a wildly different professional history, how on earth could the same resume format work for all of us? If you've only had one job, then a single page works fine. But how about the CEO who swoops in -- drives a turnaround -- and flies away to her next challenge? She's probably had 5-7 jobs in the past 15 years. One page won't work. Or how about a freelancer with tons of gigs and types of experiences? Or the guy who has worked his way up through seven progressive promotions? One page will not work for any of them. Let your work history make the choice for you. Should I use different colors, fonts, or other design elements on my resume? Should I include jobs I have had that do not relate to the position I am applying for? Sometimes. If the job is more than 10 years ago, feel free to omit it. If the job is more recent than that, then you need to show that you haven't been sitting on your couch binging Netflix 24x7. An unrelated job is better than a resume gap. Do I need to include my GPA on my resume? How can I make my resume stand out? The best way to make your resume stand out is to do a great job at work. The more accomplishments you have, the more we'll have to write about and the more irresistible you'll be as a candidate. Did you exceed your sales quota by 120%? Write about it. Did you land a huge account? Write about it. Did you uncover a substantial source of savings? Write about it. Did you correct an inefficiency that improved productivity? Write about it! What mistakes do you often see on resumes? Typos. And not just any typos -- really spectacular typos. I once had a client send me their resume and he had written about working third shift in a production facility except he accidentally omitted the "f." His "shift" had turned into "sh*t." Spellcheck didn't catch it because, of course, "sh*t" is an actual word. The moral of the story here is to very, very carefully proofread. Lists of job duties. Ugh. So boring! I don't really care what you were responsible for -- I care what you actually accomplished. Being "responsible" for something doesn't actually tell me what you truly did day to day. It only tells me what you were supposed to do. Instead, focus on your wins and the stuff you're really proud of. Beginning each bullet with the same word. It drives me crazy when I see each bullet begin with "Managed" or "Responsible for" or "Led." There are so many other words out there! Instead, pull your action verbs from the job ad -- the company you're applying to will have all kinds of verbs in their job announcements. Not only will your resume be less boring, but you'll be using the same language as your next potential employer.